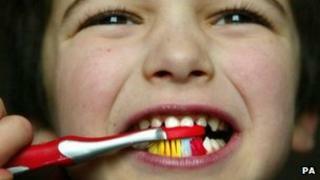 A record number of primary one pupils have no signs of tooth decay, the Scottish government has said. Figures from the national dental inspection programme, for 2011-12, showed 67% of P1 pupils had no obvious decay, compared to 54% in 2005-06. The Scottish government's target is for 60% of primary ones to have no obvious signs of decay. This year is the first time that all 14 health boards in Scotland have met the target. Public health minister Michael Matheson said: "It is fantastic news that record numbers of primary one children have no obvious signs of decay and, for the first time, all NHS boards have exceeded the target - that 60% should have no obvious signs of decay. "This tremendous progress is the result of our significant investment in children's dentistry over recent years. "It is also tribute to our work with the British Dental Association and the commitment of Scottish dentists to deliver the Childsmile programme. "However, it is extremely important that we continue this work as we know that the best way to improve the nation's dental health is in childhood." Scotland's chief dental officer, Margie Taylor, urged parents to teach children the importance of keeping their teeth clean and to restrict sweets to meal times as much as possible. She added: "Children develop their oral health habits, good or bad, at a very young age. "I know that a selection box can put a smile on the face of most children, but it's important that parents keep those smiles healthy."